If there is one room in my house where I could use a little bit of help, it's the kitchen. It always seems to need more storage, and I always want to speed up my cooking processes too. I guess that means it's a good thing that there are tons of kitchen hacks out there for people like me. Whether you want to become more organized, are looking for better storage solutions, or want to make better french fries, there really is a hack for everyone. 1. 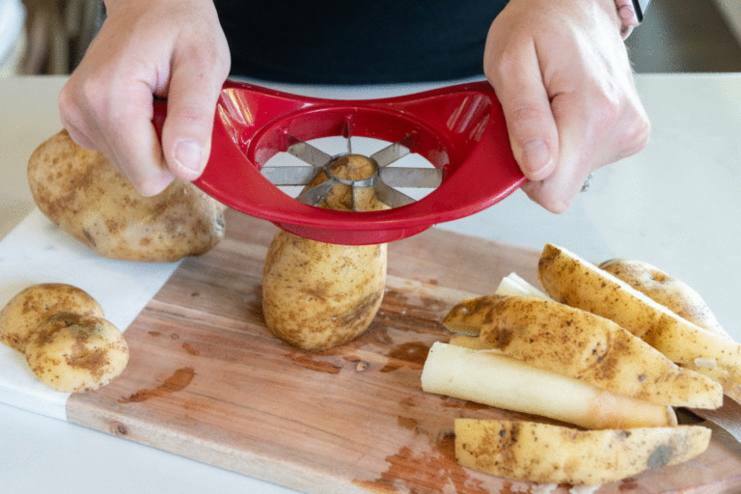 Use an apple slicer to cut your potatoes for french fries. I absolutely hate cutting potatoes for french fries. I can never seem to get them uniform in size, and it takes way too long. The Krazy Coupon Lady suggests using an apple slicer to make things easier and faster! 2. 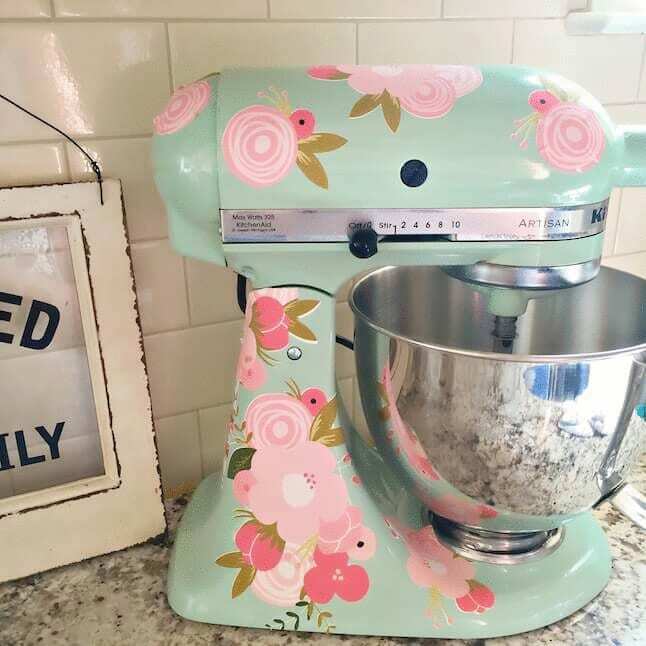 Give your stand mixer a makeover with vinyl decals or stickers. 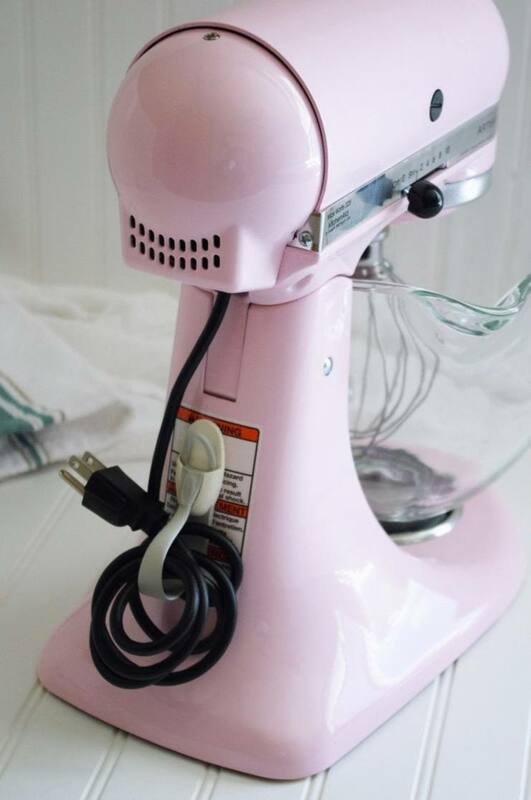 It seems like everyone and their mother has a KitchenAid stand mixer in their home, so why not make yours stand out? Kayla Makes added fun and colorful decals to hers! 3. Use a pegboard to hang your pots and pans. This is a great alternative storage solution from A Beautiful Mess, especially if you don't want to put multiple holes in the wall for hanging purposes! You can screw the pegboard into the wall and use hooks to hang all of your kitchen wares. 4. 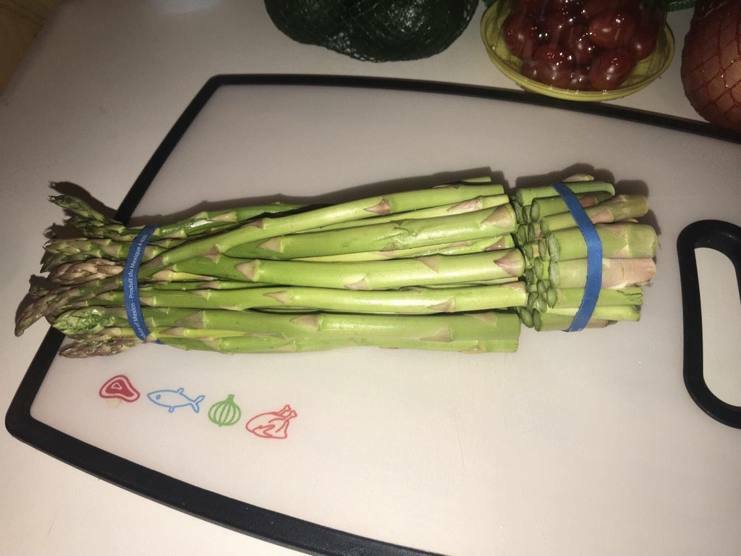 Use elastic bands to keep your asparagus from rolling everywhere. I actually hate prepping and cutting any kinds of vegetables, but after potatoes the worst is probably asparagus. This makes it so much easier as you don't have to worry about them rolling off the counter. 5. Use a blow torch to pop the cork out of a bottle of wine. I've also heard this works pretty well if you have a BBQ lighter on hand. Which is good since I don't really know many people who've got a blow torch just hanging around. 6. Coffee Mate bottles will be your best friend. 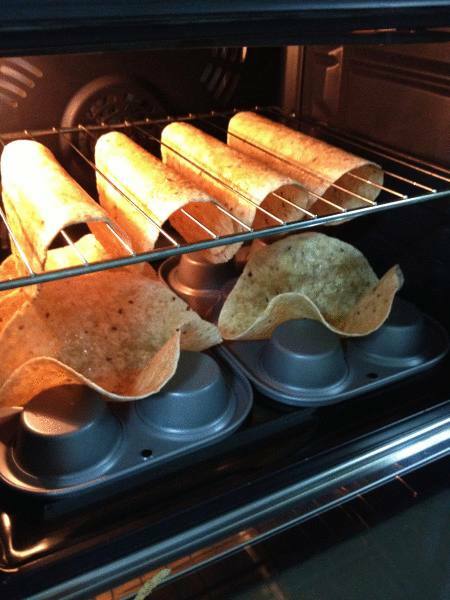 You can rip the plastic label off of them and use them to store all sorts of different things in your kitchen. FrugElegance over on Hometalk stores popcorn and chocolate chips just to name a few. 7. Grab a tension rod and stick it under your sink. I love Hometalker Shawna Bailey's idea of hanging your cleaning products off of them. Tension rods are super useful for more than just holding up your shower curtain. 8. Add a couple of magnets to a plastic basket to hang on the fridge. 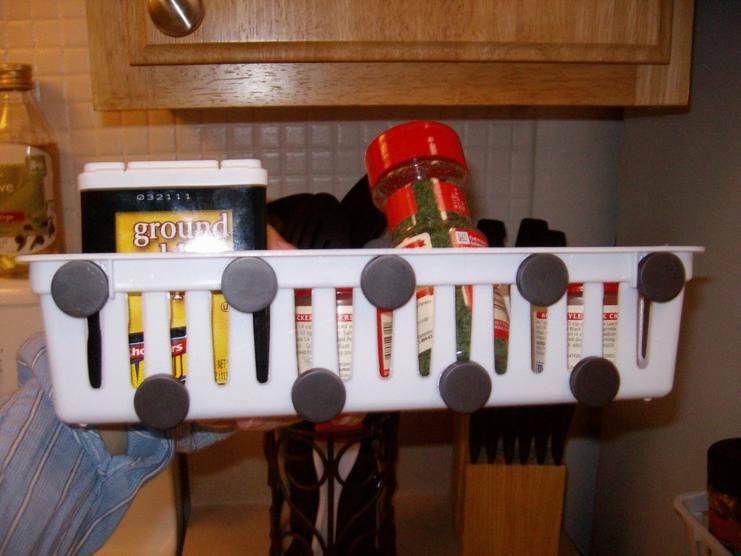 Instructables user sbhayes09 uses theirs as a spice rack, but you could definitely put all sorts of trinkets and other important things in there. 9. 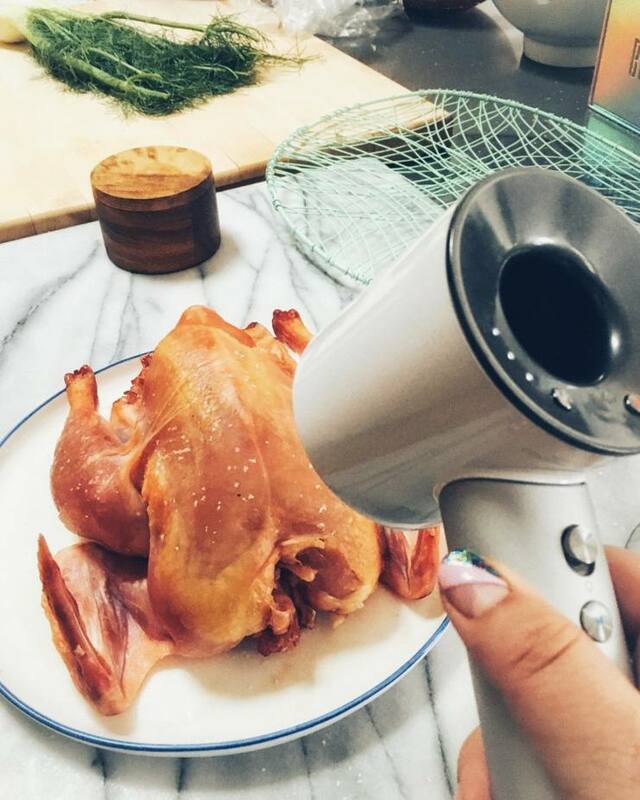 Use a hair dryer to get the moisture out of your chicken skin. This way when you bake that sucker, it's going to get all crispy brown. Food Correspondent Helen Rosner swears by this trick. 10. Use ice pop baggies to create extra long ice cubes. First of all, where can I get these ice pop baggies? 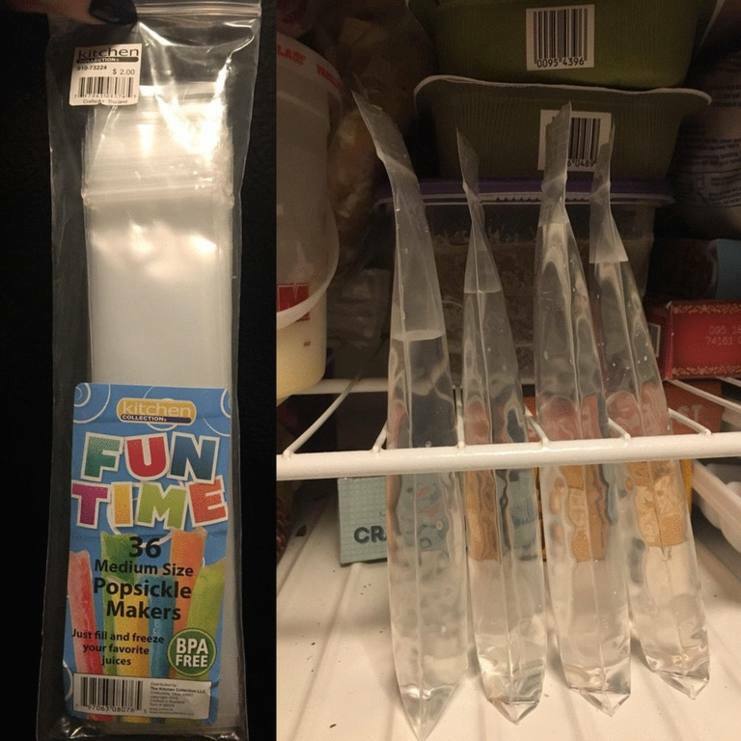 Because I want to make my own freezies! Second of all, this is great if you aren't able to find the extra long ice cube trays. 11. 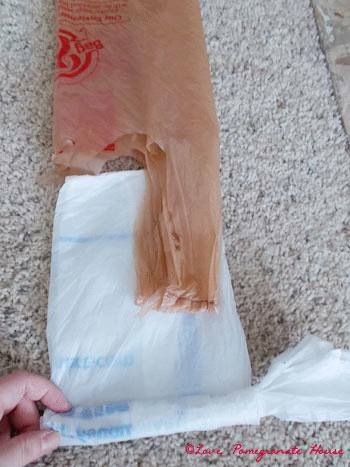 Save yourself from digging under the sink for plastic bags. I pretty much stuff all my plastic bags under the sink as soon as I'm done grocery shopping. It's always a mess under there. Love, Pomegranate House rolls theirs up and puts them inside of old Lysol containers. This way they dispense really easily, and they are out of sight and stored in cute containers! 12. Rinse a whole bunch of potatoes all at once using the top rack of your dishwasher. This rack doesn't get nearly as hot as the bottom one, and one rinse cycle without soap will get them nice and clean. Hodgepodge shared this rad tip! 13. 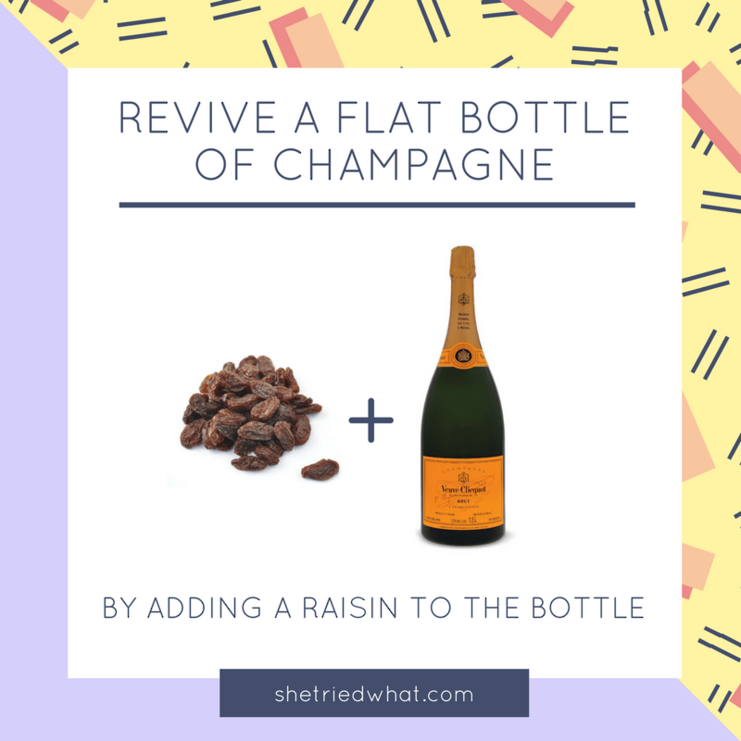 Turn your frown upside down and add a raisin to a bottle of flat champagne. I'd love to know the science behind this, but if She Tried What says it works, then I'll believe them! 14. 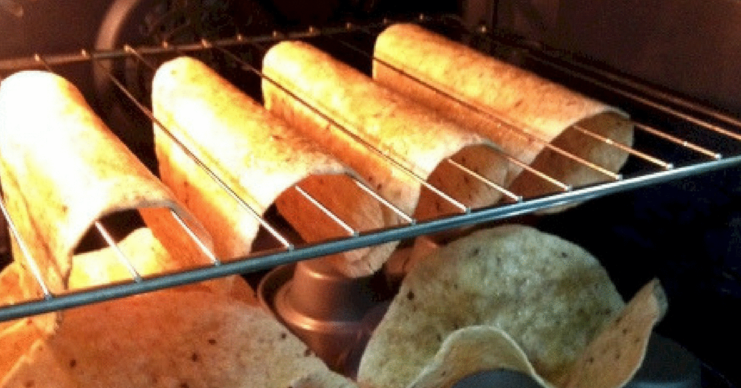 Turn soft tortillas into hard taco shells in the oven. 15. Command hooks can keep kitchen cords neat and tidy. Heavy duty cords from machines like stand mixers are super hard to control! But Dreaming In DIYsuggests using a command cord organizer on the back to hold them tight.